Kills Salmonella choleraesuis ATCC 10708, Staphylococcus aureus ATCC 6538, Streptococcus pyogenes ATCC 9342, Escherichia coli ATCC 11229, Enterobacter aerogenes ATCC 13048, Shigella sonnei, Candida albicans. Castle® I-99™ is also an excellent deodorant. It is especially effective in controlling odors that are bacterial in origin. 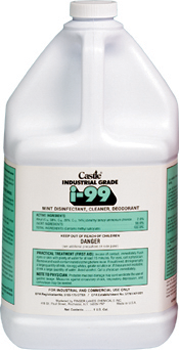 Castle® I-99™ Disinfectant mixes readily with water and makes a clear stable solution. In use dilution it is non-corrosive and non-staining to plastic, vinyl, synthetics, enamel, tile, and most common metals. Has a pleasant mint odor. 1. Please consult instructions on bottle for specific uses.